PHOTO COURTESY OF TIFFIN UNIVERSITY Tiffin University tailback JaQuan Hardy finds a seam against the defense during the program’s spring game at Frost-Kalnow Stadium in Tiffin. 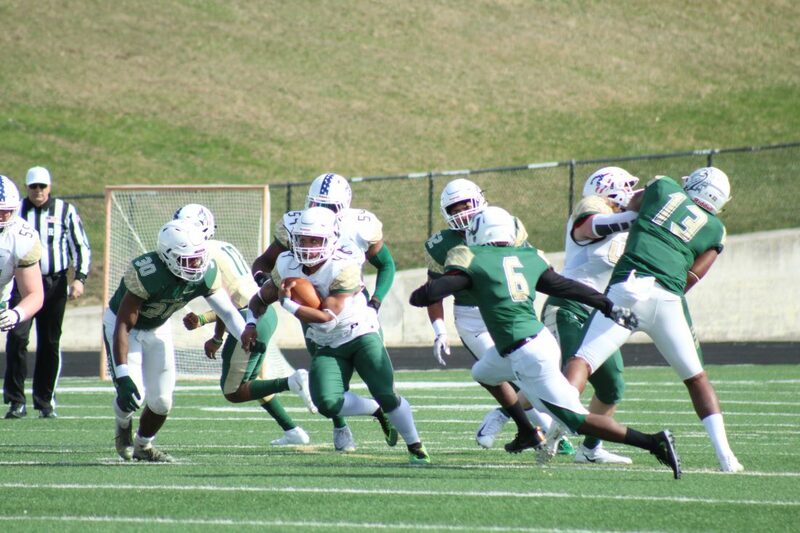 Despite falling behind the Offense 17-0, the Defense escaped with a 51-48 win in the TU annual spring football game Saturday — the first for new coach Cris Reisert. Joe Harakai had a chance to win the game with a 37-yard field goal for the Offense with the game tied at 48, but the kick failed. The first score was a 5-yard TD run by QB Nick Watson. Beside the normal scoring, the Offense got points for runs of longer than 12 yards and pass completions of 16 yards as well as getting consecutive first downs. The defense got points for turnovers, three-and-outs and tackles for loss/sacks. The offense made it 17-0 when Jay Volpenhein tossed a 57-yard TD to Franklin Stewart. The Defense grabbed a 37-32 lead after a sack by Blake Barnes, but the Offense finished the opening half with a Watson TD toss to Devon Lynch for 33 yards to give the Offense a 40-37 lead. The Dragons played one more quarter with a running clock. “We had good energy on both sides of the ball,” Reisert said. “We made strides each day of spring practice. The offense protected the ball well and we ran well especially in the first quarter. We controlled the line well at times.